I had the pleasure of being introduced to Kaitlin Gregg Goodman who qualified for the Olympic trials at the 2014 California International Marathon, with a 2:39 finish. At first I thought, “is this real life?” What an honor to share with all of you and ask questions only a carb loving runner would wonder. It’s not everyday you get to befriend an athlete that has a shot at becoming an Olympic marathon runner. I recently caught up with Kaitlin while she was training in her hometown of Davis, Calif., for the upcoming Olympic trials and learned more about her life. Her story is truly inspiring and you will learn from a pro runners perspective that all miles good and bad are worth “running joyfully” through. When did your love of running begin?My love of running began at an early age – my dad was a runner and I ran my first 5k with him at age 8 (well, I ran most of the way – there were a few walk breaks!). I wasn’t the most coordinated child (hand-eye coordination wasn’t my forte) but I could run fast, so when I reached junior high school, joining the cross-country and track teams was an easy choice. I’ve been running competitively ever since, and loving it. How long is your training plan for a race this important? I began my buildup for the Olympic Trials marathon back in November. 3.5 months is a little longer than normal for me for a marathon, but I wanted to have adequate time to gradually increase my mileage before the Trials. It’s been a long but great training segment! How do you balance being married, running, and coaching? I’m blessed to have a very supportive husband who is very committed to my running goals. He will frequently bike with me on my long runs (he’ll carry my PowerGels and water for me), so we get to spend extra time together that way. It’s tough when my training or races take me away from our home in Providence, so I’m very thankful for FaceTime when we’re apart. Coaching is easy to balance with my own running because it doesn’t feel like work to me – it’s really fun for me and I love watching my athletes hit new milestones and reach their goals. What inspires you when you have a bad run? When I have a bad run, I think about a friend of mine who is currently battling cancer. She fights every day and approaches cancer with courage, through the good days and the bad ones. She has a positive attitude and such strength, and she continually inspires me to keep pressing on. The marathon can be a really emotional race, and I had so many thoughts going through my mind during my qualifying marathon at CIM. Before the race, I dedicated different miles of the marathon to important people in my life – a mile for each of my siblings, a mile for friends who’ve supported me, for family members, a mile for my husband. These dedications helped me focus during the race, thinking about specific special people rather than the pain. But the later miles were quite challenging, and my mind was filled with self-doubt, wondering if I could do it. 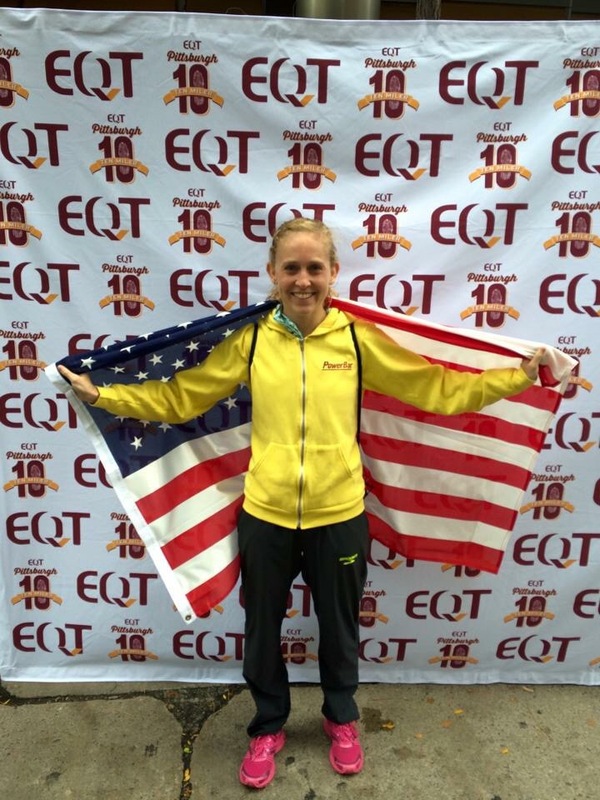 At the end of marathon, when I made the last turn onto the home stretch toward the Capital, I was overwhelmed with joy – for reaching my goal and qualifying for the Olympic Trials, and also that the race was over – I was so relieved to be done! When racing, I often repeat “calm + controlled” to myself in the early miles to make sure I don’t go out too fast. In the later miles, when the going gets tough, I tell myself “one mile at a time” – it helps me to break it down and focus on the mile I’m in at the moment, rather than getting caught up on how much farther I have to go. For beginning runners what would you tell someone who just signed up for their first race? First, congratulations! Second, find a friend or group to run with – running is social and so much more fun with a training partner. If you have questions as you’re getting started, be it about workouts, fueling, or race strategy, don’t be afraid to ask questions of fellow runners, or seek out the expertise of a coach. Mostly, just have fun out there – racing should fun, not a chore or something you “have” to do. So embrace the training and enjoy it! Do you have a pre-race ritual you always do? A meal you always eat? The night before a race, I like to have a meal of a salad and pasta with chicken. Before bed, I’ll have a small piece of dark chocolate and then will watch some Netflix to take my mind off the race and calm my nerves. The morning of a race, my go-to meal is two slices of wheat toast with peanut butter and honey. And COFFEE – a must for me! I’ll eat this about 2 hours before I warm up. An hour before the race starts, right before I warm up, I’ll have half a packet of PowerBar Energy Blasts (my favorite is the Strawberry-Banana flavor since it has a little caffeine) and some water. Then it’s go-time! If you weren’t a pro runner what would you be doing? If I wasn’t running professionally, I’d be working in public health. I’m really passionate about helping people live healthy, active lives. I’ve previously worked in corporate wellness and next fall I’ll be going back to school to get my Masters in Public Health at Brown University.